Set in 200 acres of rolling Gloucestershire countryside, Brickhampton Court Golf Complex was lovingly created by the Creed family in 1994 and is still run by the same family. With a reputation as one of the top courses in the area, Brickhampton is truly a first class welcoming place for both members and visitors. The complex comprises of 27 holes of which our Spa course par 71 6449 yard of mature tree lined enchanting golf designed by renowned international golf architect, Simon Gidman. Whether a beginner or an experienced player, there is something for everyone. In addition to two excellent golf courses, Brickhampton extensive practice facilities are superb. With a 28 Bay floodlit driving range of which 15 bays benefit from the latest Power Tee technology, catering for all elements of your game. Brickhampton also has two fully stocked pro-shops and state-of-the-art simulator for tailor made products. Brickhampton’s Restaurant and Bar offers a relaxed and friendly atmosphere to host conferences, special function or simply to enjoy a meal. Whether you’re a golf society looking for delicious food after a round of golf, practising your game on our state-of-the-art simulator, just looking for a morning coffee or relaxing lunch, you will love the welcoming atmosphere at Brickhampton. We pride ourselves in offering an experience you will not forget. breakfast, lunch and evening dining options. Winter Society – From £28. Summer Society – From £36. Located only minutes from junction 11 of the M5 and half way between Cheltenham and Gloucester on the B4063, making Brickhampton the idea place to hold your conference or off-site meeting. Both only 5-10 minute drive away. 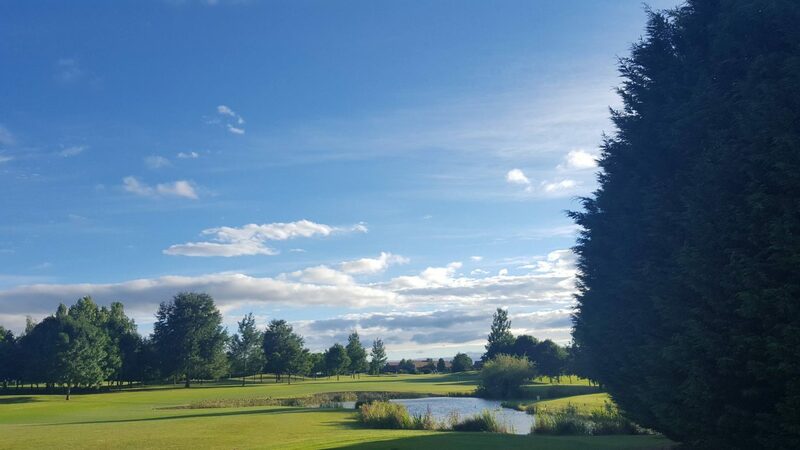 9-Hole Glevum Course, 28 bay driving range, putting green, golf simulator, Footgolf & Rugby Golf, 3 conference/function rooms for hire, plus full catering facilities available from nineteen at Brickhampton, Free WIFI and large car park.